Trading stocks that trigger major breakouts can lead to massive profits. Once a stock trends to a new high or takes out a prior overhead resistance point, then it's free to find new buyers and momentum players who can ultimately push the stock significantly higher. Breakout candidates are something that I tweet about on a daily basis. These are also the exact type of stocks that I love to trade and alert to my subscribers in real-time. I frequently flag high-probability setups, breakout plays and stocks that are acting technically bullish. These are the stocks that often go on to make monster moves to the upside. What's great about breakout trading is that you focus on trend, price and volume. You don't have to concern yourself with anything else. The charts do all the talking. One energy player that's starting to rip within range of triggering a big breakout trade is Ocean Rig UDW (ORIG , which operates as a subsidiary of Ocean Rig UDW Inc. This stock has been smacked lower by the sellers over the last six months, with shares falling sharply by 41.2%. If you take a look at the chart for Ocean Rig UDW, you'll notice that this stock recently formed a triple bottom chart pattern, after shares found some buying interest at 68, 70 and 69 cents per share over the last month. Following that potential bottom, shares of Ocean Rig UDW has now started to trend back above its 20-day moving average of 79 cents per share, and it's quickly moving within range of triggering a major breakout trade above some key overhead resistance levels. Traders should now look for long-biased trades in Ocean Rig UDW if it manages to break out above some key near-term overhead resistance levels at 87 to 89 cents per share with high volume. Look for a sustained move or close above those levels with volume that hits near or above its three-month average action of 2.59 million shares. If that breakout develops soon, then this stock will set up to re-test or possibly take out its next major overhead resistance levels at $1.02 to its 50-day moving average of $1.16 a share, or even its previous gap-down-day high from August at $1.20 a share. Any high-volume move above $1.20 will then give this stock a chance to re-fill some of its previous gap-down-day zone that started near $2.20 a share. Traders can look to buy Ocean Rig UDW off weakness to anticipate that breakout and simply use a stop that sits just below is 20-day moving average of 79 cents per share. One can also buy this stock off strength once it starts to take out those breakout levels with volume and then simply use a stop that sits a comfortable percentage from your entry point. A oil and gas drilling player that's starting to trend within range of triggering a near-term breakout trade is Pioneer Energy Services (PES - Get Report) , which provides land-based drilling and production services to oil and gas exploration and production companies in the U.S. and Colombia. This stock has been red hot with the bulls over the six months, with shares soaring higher by 85.2%. If you take a glance at the chart for Pioneer Energy Services, you'll notice that this stock recently formed a double bottom chart pattern, after shares found some buying interest at $3.15 to $3.12 a share over the last few weeks. Following that potential bottom, shares of Pioneer Energy Services have now started to rip sharply higher and trend back above both its 50-day moving average of $3.47 a share and its 20-day moving average of $3.55 a share with strong upside volume flows. That move is now quickly pushing this stock within range of triggering a near-term breakout trade above some key overhead resistance levels. 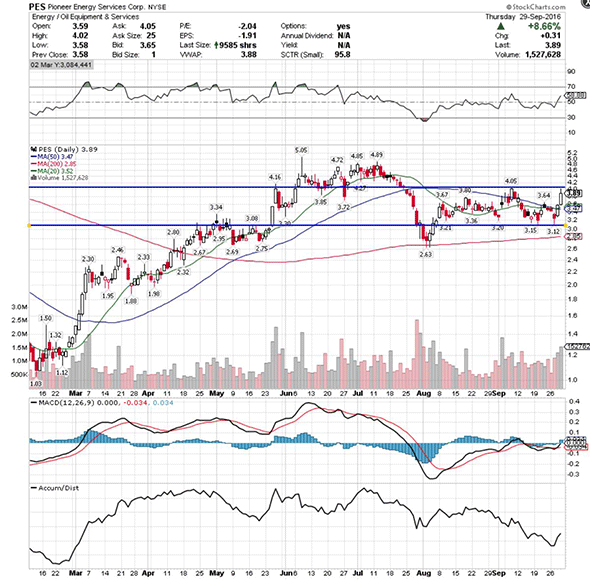 Traders should now look for long-biased trade in Pioneer Energy Services if it manages to break out above some near-term overhead resistance at $4.05 a share with high volume. Look for a sustained move or close above that level with volume that hits near or above its three-month average action of 983,341 shares. If that breakout triggers soon, then this stock will set up to re-test or possibly take out its next major overhead resistance levels at $4.89 to its 52-week high of $5.05 a share, or even $5.50 to $6 a share. Traders can look to buy Pioneer Energy Services off weakness to anticipate that breakout and simply use a stop that sits right below its 50-day moving average of $3.47 a share, or around those recent double bottom support levels. One could also buy this stock off strength once it starts to clear those breakout levels with volume and then simply use a stop that sits a comfortable percentage from your entry point. Another basic materials player that's starting to trend within range of triggering a big breakout trade is Agnico Eagle Mines (AEM - Get Report) , which engages in the exploration, development and production of mineral properties in Canada, Finland and Mexico. This stock has been on fire over the last six months, with shares ripping higher by 47.8%. 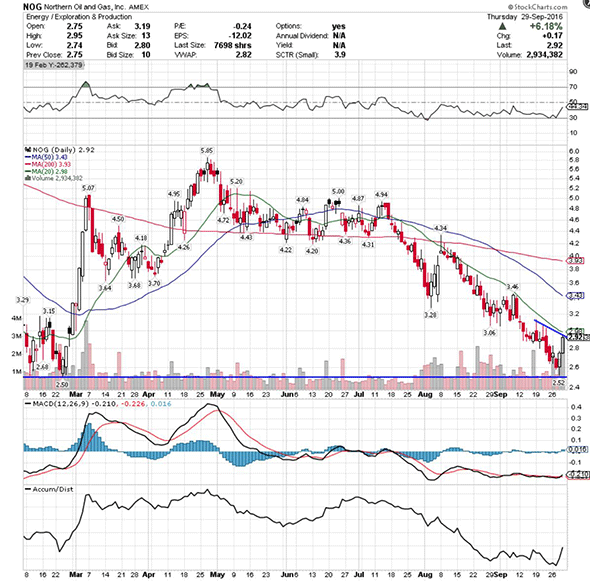 If you take a glance at the chart of Agnico Eagle Mines, you'll notice that this stock recently formed a double bottom chart pattern, after shares found some buying interest at $50 to $50.03 a share over the last month. 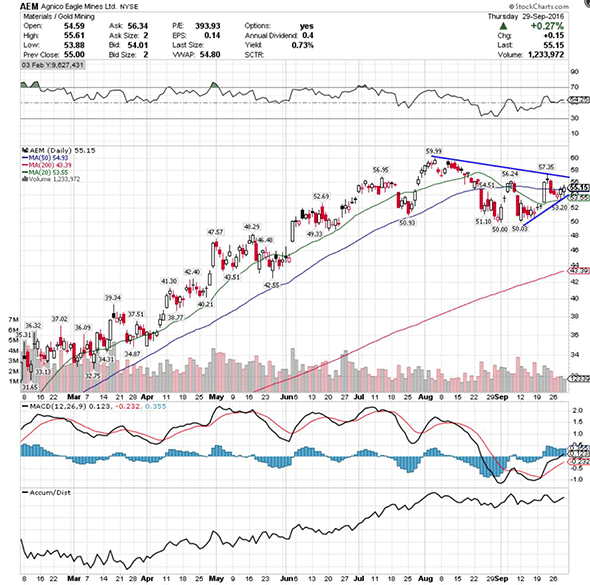 Following that potential bottom, this stock has now started to uptrend and move back above both its 20-day moving average of $53.71 a share and its 50-day moving average of $54.98 a share. That uptrend is now quickly pushing shares of Agnico Eagle Mines within range of triggering a big breakout trade above some key overhead resistance levels. Traders should now look for long-biased trades in Agnico Eagle Mines if it manages to break out above some near-term overhead resistance levels at $55 to $57.35 a share with high volume. Look for a sustained move or close above those levels with volume that registers near or above its three-month average action of 1.84 million shares. If that breakout hits soon, then this stock will set up to re-test or possibly take out its next major overhead resistance levels at its 52-week high of $60 a share, or even $65 to $70 a share. Traders can look to buy Agnico Eagle Mines off weakness to anticipate that breakout and simply use a stop that sits just below its 20-day moving average of $53.71 a share or right around those recent double bottom support levels. One can also buy this stock off strength once it starts to trend above those breakout levels with volume and then simply use a stop that sits a comfortable percentage from your entry point. Another independent energy player that's starting to spike within range of triggering a near-term breakout trade is Northern Oil and Gas (NOG - Get Report) , which engages in the acquisition, exploration, development and production of oil and natural gas properties in the U.S. This stock has been under heavy selling pressure over the last six months, with shares off by 27.5%. If you take a glance at the chart for Northern Oil and Gas, you'll notice that this stock has been downtrending badly over the last six months, with shares falling sharply off its high of $5.85 a share to its recent low of $2.52 a share. During that downtrend, this stock has been making mostly lower highs and lower lows, which is bearish technical price action. That said, shares of Northern Oil and Gas have now started to rebound off that $2.52 low with heavy upside volume flows. That high-volume rebound is now quickly pushing this stock within range of triggering a near-term breakout trade. Traders should now look for long-biased trades in Northern Oil and Gas if it manages to break out above its 20-day moving average of $2.96 a share and then above more key near-term overhead resistance levels at $3.06 to $3.20 a share with high volume. Look for a sustained move or close above those levels with volume that hits near or above its three-month average action of 1 million shares. 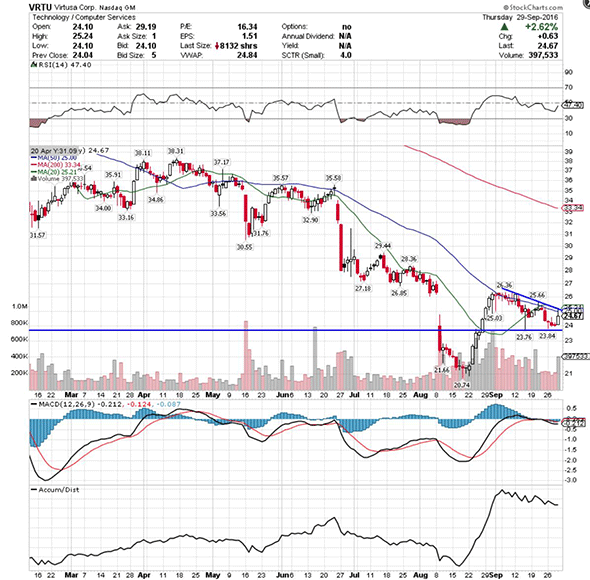 If that breakout materializes soon, then this stock will set up to re-test or possibly take out its next major overhead resistance levels at its 50-day moving average of $3.41 a share to $3.87, or even its 200-day moving average of $3.92 to $4.34 a share. Traders can look to buy Northern Oil and Gas off weakness to anticipate that breakout and simply use a stop that sits right below its recent low of $2.52 a share. One can also buy this stock off strength once it starts to bust above those breakout levels with volume and then simply use a stop that sits a comfortable percentage from your entry point. My final breakout trading prospect is technology player Virtusa (VRTU - Get Report) , which operates as an information technology services company. This stock has been hit hard by the sellers over the last six months, with shares down sharply by 31.3%. 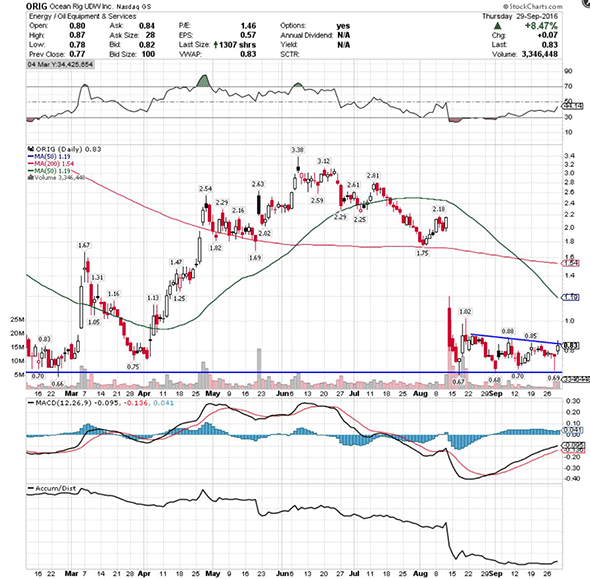 If you look at the chart for Virtusa, you'll notice that this stock recently formed a double bottom chart pattern, after shares found some buying interest at $23.76 to $23.84 a share over the last few weeks. Following that potential bottom, this stock has now started to spike a bit higher and flirt with its 50-day moving average of $24.94 a share and its 20-day moving average of $25.12 a share. That spike to the upside is now quickly pushing shares of Virtusa within range of triggering a major breakout trade above some key overhead resistance levels. Traders should now look for long-biased trades in Virtusa if it manages to break out above both its 50-day moving average of $24.94 a share and its 20-day moving average of $25.12 a share and then above more key overhead resistance levels at $25.24 to $25.66 a share and $26.36 a share with volume that hits near or above its three-month average action of 276,242 shares. If that breakout fires off soon, then this stock will set up to re-test or possibly take out its next major overhead resistance levels at $28.36 to $29.44, or even $31 to its 200-day moving average of $33.24 a share. Traders can look to buy shares of Virtusa off weakness to anticipate that breakout and simply use a stop that sits right around those recent double bottom support levels. One can also buy this stock off strength once it starts to move above those breakout levels with volume and then simply use a stop that sits a conformable percentage from your entry point.